Fowler has released records on Kill Rock Stars and Upset The Rhythm and he toured with Tracy + The Plastics, Xiu Xiu,The Quails, and Animal Collective. Since 2007, his output has been mostly dedicated to sculpture and installation, exhibiting in galleries and museums internationally including Rental, Rivington Arms, Untitled, and The New Museum in New York; The Aspen Museum; A Palazzo in Italy; and Gallerie Thadeus Ropac in Paris. While Fowler splits his output between performance and sculpture, one can see links between both bodies of work. Though he takes full advantage of medium specificities, both strains of his practice are formalized deconstructions of a very personal narrative. 2013 promises to be a busy year for Fowler, with major solo shows lined up in New York and Los Angeles, a new monographic book split between his studio and performance works, and a new performances as And Martin. 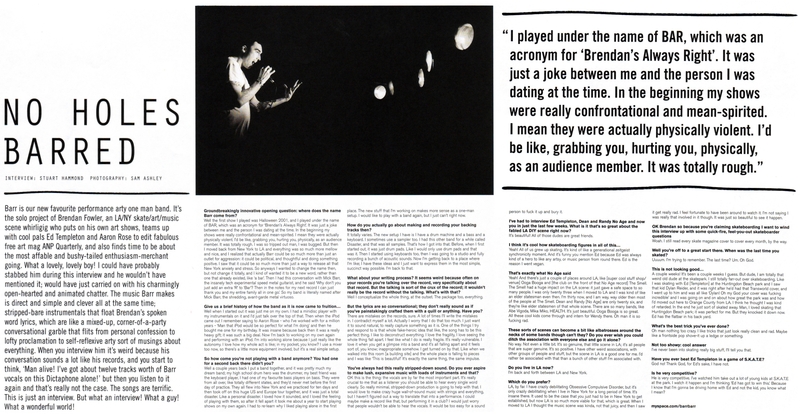 Booking Brendan Fowler, Interview Magazine, Asher Penn, June, 2009.